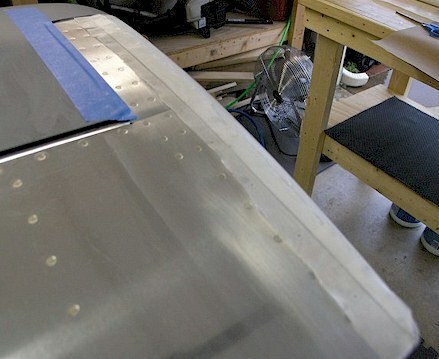 I've decided to share what I have learned in my crack filling episodes where the fiberglass meets the metal, namely the elevators, rudder and horizontal stabilizer. I don't claim to be an expert, but an adventurer, picking the brains of those who have covererd their cracks (he-he) in the past. You'll notice that the pictures below are from different parts of the airplane. That's because I'm the world's worst at remembering to take pictures! 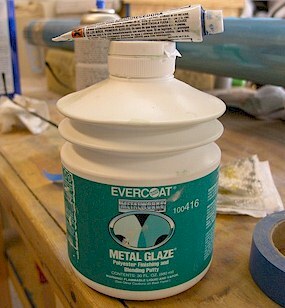 I got this Evercoat Metal Glaze from Amazon.com. It's expensive but works nicely as a filler. WARNING: Wear a really good auto paint mask when working with this stuff. The ingredients are very toxic. After putting a coat of resin on the scuffed surface, I layed the cloth down over the gap and gently tapped it down with a brush until the cloth was totally immersed in the resin. After it dried (usually in 24 hours), I sanded down the surface to smooth down the bumps. Then I mixed up a small portion of the Evercoat Metal Glaze (be sure and were a good auto paint mask!). Then I used a plastic spreader and put an initial thin coat over the resined area. This stuff starts setting up right after you mix it. You have maybe 3 minutes before it is unworkable. Remember, the more you put on, the harder you have to work to sand it off later. 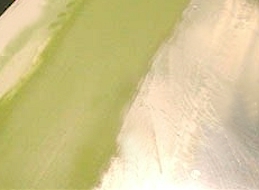 Wait 20 minutes after applying the Evercoat to sand to surface. 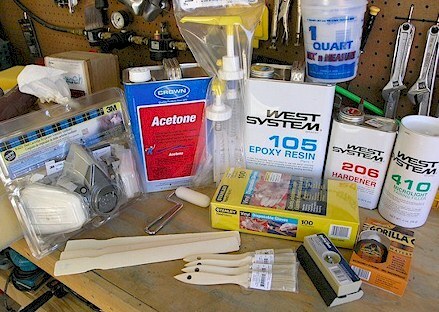 Use 200-300 grit sandpaper wrapped around a flat piece of wood. NEVER sand without the piece of wood. If you sand just using your hand, you will get dips in the finish. Use your own judgment on the grit of the sandpaper. The stronger the sandpaper, the more scratches you have to fill in later. Here's a picture of the plastic spreaders. 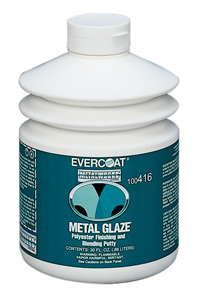 Be prepared to put to apply several applications of the Evercoat filler until you get the results you want. 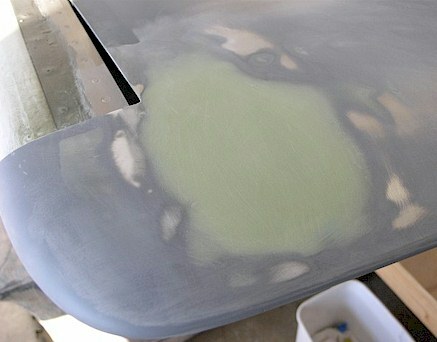 Each thin application is to fill in low spots from the previous application. If you have ever worked with taping and bedding sheetrock, it is very similar. Use sandpaper wrapped around a flat piece of wood and it will give you a nice uniform surface. 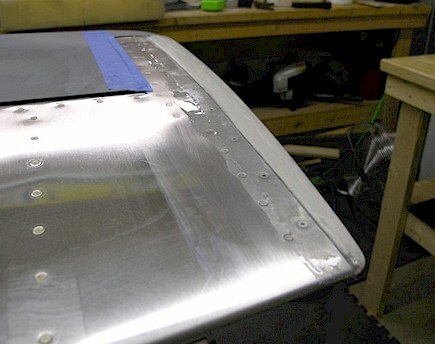 Be sure and feather the filler out to the edges into the aluminum. It should look like the picture below when you're done. Now for the ultimate test. When you get to the point when you think it's perfect, put a coat of primer (same stuff you've been using on your aluminum) on your creation. 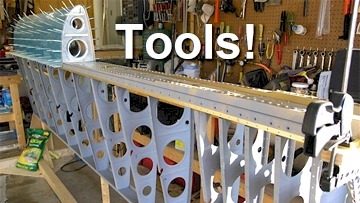 Then stand back with your project between you and some outside source of light (like an open garage door). Then you can see what a crappy a job you did! In other words, be prepared to add more filler! 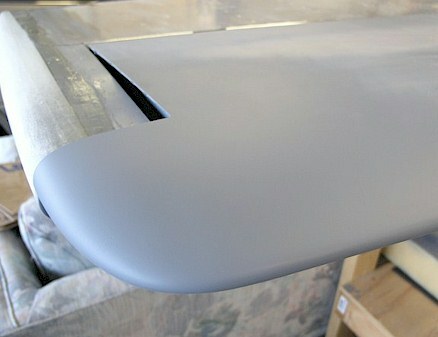 Just lightly sand it down and apply more filler and sand some more. You don't have to remove the primer, just rough it up. Repeat this process until your satisfied OR you want a beer!